Preserve the look of your Fifth Wheel Toy Hauler with a quality RV cover by ADCO or Classic. 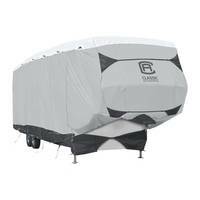 We stock 5th Wheel Toy Hauler Covers in Tyvek Wind, SFS AquaShed, and PerrmaPRO, each offering durable long-lasting protection from hazards like UV rays, snow, and ice. Our covers are guaranteed to fit your 5th wheel toy hauler, and feature zippered access panels at the rear for easy access when covered. ADCO Products, Inc. offers a remarkable line of covers for your needs. With over 55 years of experience, this family-owned business takes pride in their products. They guarantee durable and high-quality products that will exceed your expectations. ADCO features the Two-Tone Designer SFS AquaShed and the Two-Tone Tyvek Wind. 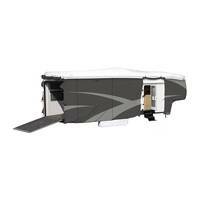 Each cover provides a sleek appearance, and, more importantly, superb protection for your RV. Classic Accessories has been in business for over 30 years providing high-quality covers for various units. 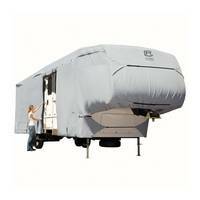 They know that it is important to provide efficient and attractive RV covers for your lifestyle. Classic accessories will not disappoint with the PermaPRO material, which is 100% woven polyester for exceptional water repellency. The sleek, cool, gray-toned cover provides a simple, appealing look for your RV.